This is a completely non-Christmasy post. It is about cold sores. Or, rather, a remedy for them. I am one of the chosen ones. The ones special enough to carry the virus that blesses us with an outbreak of fever blisters or cold sores at least once a year. I’ve enjoyed this blessing since I was a child. Lucky me. They start as a little tingle or itch…. but they become very itchy, quite painful, and rather embarrassing. A mild case may heal up in less than a week, but a bad one can go on for 2 – 3. Over the years I’ve tried a multitude of remedies for these obnoxious blisters on my lip with very little success. I have found that ice very temporarily helps reduce the itching. Tea Tree essential oil (which is a staple of my medicine chest) can help with the itching, plus I know that it is anti bacterial, anti viral, etc. Lysine supplements are supposed to help… don’t know if they have. To my surprise and delight, Abreva actually worked! I felt the tell-tale signs of an outbreak about 5 days ago, and started applying Abreva 4 – 5 times a day. It is now nearly completely healed. I had only 2 days of noticeable itching, and the cold sore never swelled up large like it usually does. In fact, if you’d seen me you probably wouldn’t have even noticed the little blister on my lip. So I’m giving Abreva 4 clams. I would give it 5, but the tube is quite expensive and very easy to misplace, because it is so tiny. 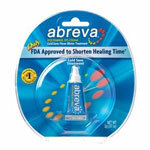 But if you, like me, suffer from cold sores – Abreva is a must have remedy for your medicine cabinet. But be smarter than I was… buy it at Amazon for less! I am so glad that I somehow lucked out and have never had a cold sore. They seem like they would indeed be miserable. I am happy you found something that works! Now if you could find something that would let me regrow the eyelashes I recently (and inexplicably) lost, that would be simply marvelous. this is weird…I just walked up the stairs after waking up and said to Paul, “Guess what? I have a cold sore.” and here is the stranger part. I put Abreva on it when I woke up. And then I went to check your blog…spooky!!! I agree about Abreva – worth every penny. I too, am lucky that I don’t get them. Sometimes I get the annoying ones on the inside of my mouth though. Are they considered cold sores? But not very often. Isn’t it lovely to find a product that actually does what it claims? I’m glad you found something that works. How I could have used Abreva a few months ago! I get cold sores too, and they are so annoying. They take forever to get rid of and they hurt. Thank you for this very informative post. I am glad you finally found something that works!! I’m lucky that I don’t get them. They look terribly painful. Craig- that is just eerie. I used to get canker sores all the time. I too read about lysine working on them. I took it, and the first time I did the sores left immediately. It never worked for me after that. Haven’t had any sores in over 12 years, so maybe the body eventually gets immunity…???…. are you sure you don’t have cameras installed here somewhere? I feel like I’m living Being John Malchovich. Better watch where you leave your web cam, Craig…. damn skype. I knew it was one of Satan’s tools. Abreva is a godsend. Enough said!! Hey….when did that cute little crab take up residence in your header? Has he always been there, and if so, how the hell did I miss that??? I’m so glad you found something that works! I have never had a cold sore, but I can imagine it would be very unpleasant to deal with. Providing your email address is not necessary, however, after your first post, when you do enter your email address, your comments will post immediately rather than wait for moderation. Don't worry, your email address will not be posted anywhere. Check this box to receive email updates for future comments on this post. Silence Of The Clams © 2007 All Rights Reserved.